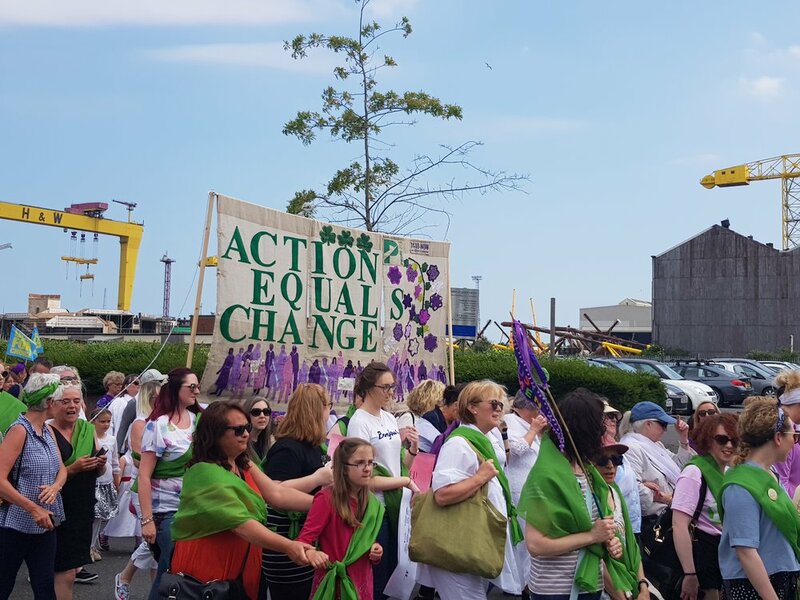 Prime Cut Productions joined thirteen other organisations from NI in supporting PROCESSIONS, a mass participation artwork marking the centenary of the Representation of the People Act, which gave the first British women the right to vote. PROCESSIONS was produced by Artichoke, the UK’s largest producer of art in the public realm, as part of 14-18 NOW, the UK’s official arts programme for the First World War centenary. PROCESSIONS invited women* and girls across the UK to come together on the streets of Belfast, Cardiff, Edinburgh and London on Sunday 10 June 2018 marking this historic moment in a living, moving portrait of women in the 21st century. The Belfast event was supported by National Lottery funding through the Arts Council of Northern Ireland and Belfast City Council. Prime Cut Productions was one of 100 organisations, including 14 from Northern Ireland, that worked with women artists up and down the country in the lead-up to the event, as part of an extensive public programme of creative workshops creating 100 centenary banners which will form part of this vast artwork.